WHEN there's heavy towing to be done, Performax International's wide range of American pick-ups have always been right up to their owners' needs – and now the importer is proving that with its own handsome hauler. Performax, Australia's leading independent importer and converter of American pick-ups, uses the latest Chevrolet Silverado and a custom fifth-wheel trailer to move vehicles every day between the wharves, its Gympie (Queensland) factory and its sales, service and parts headquarters at North Lakes, Brisbane. The rig carries up to two full-size sports trucks from the range of Chevys, Ford Super Dutys, GMC Sierras, Toyota Tundras and Nissan Titans imported by Performax, or three Haval SUVs or Great Wall utes, for which the company is Queensland's biggest retail dealer. The Silverado has 332 kiloWatts of power and 1233 Newtonmetres of torque on tap from its 6.6 litre Duramax turbodiesel V8 engine. The Allison 1000 series, six-speed automatic transmission features a towing mode that changes the shift points, plus electronic Powertrain Grade Braking. The combination has proved an ideal alternative to full-size transporters for Performax's busy schedule, combining more-than-adequate capacity with compact dimensions for urban use and exceptional driveability and comfort for up to six occupants. "Since we added the Silverado and trailer to our fleet, it's proved a highly efficient way to transport stock between our sites," Performax Director Greg Waters said. "It's on the 150 kilometre run between Gympie and Brisbane every day and safety, economy, comfort and manoeuvrability are far superior to a full-size transporter. "In addition, we have the flexibility of having our own transporter on call whenever and whenever it's needed. We believe this combination – which would work equally efficiently with one of our Ford Super Duty F-350s out front - would suit many other automotive businesses like ours." While the Performax International vehicle transporter has been custom-built for its task, all pick-ups in the company's range have outstanding towing ability, beyond the capacity of typical mass-volume SUVs, for a variety of applications. With towing capacities ranging from 4.5 tonnes to 15 tonnes, depending on configuration, Performax vehicles are popular for towing boats, large vans, horse floats and even racing cars – Performax International sponsors the new national Trans-Am 2 series for American muscle cars. Calling on more than 25 years' experience, Performax International offers unparalleled service for buyers seeking a tough, capable and luxurious workhorse for every purpose. Its Gympie factory employs the latest design and engineering technology to ensure every RHD vehicle complies with all Australian Design Rules and performance, durability, driveability, interior finish and comfort are true to factory-original standards. All are backed by a 3-year, 100,000 km warranty. 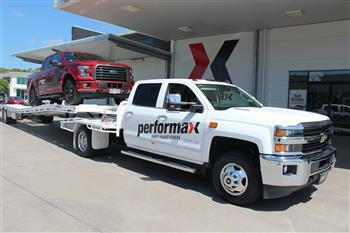 Performax's Chevy Silverado 3500 tows two full-size pick-ups.